Replies: 117 (Who? ), Viewed: 111634 times. This tutorial explains how to create an additional roof colour, using SimPE's Object Workshop. 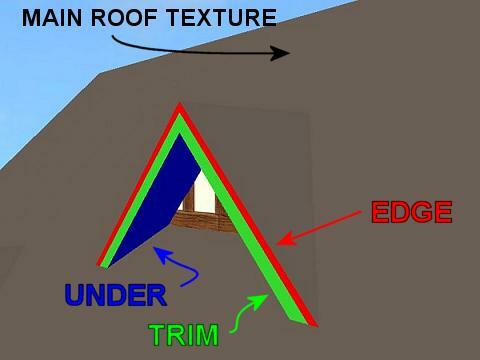 The information provided are widely based on RGiles' findings about roofs; nevertheless, the method used here is different than the one explained by RGiles in his old tutorial, because in the meantime SimPE has gained the ability to automatically perform many actions, when creating a new roof. The Nvidia DDS Utilities: get them from this page and install them; then, start SimPE, select the menu Extra / Preferences and fill in the field "Nvidia DDS Tools" with the exact installation path. HINT: The Advanced Mode makes SimPE run a little slower; you can deactivate the option when you are done with the roof. HINT: Use the "Start" button to recolour Maxis stuff (objects, roofs, fences, NH objects...); use the "Open" button to recolour custom objects. After having hit "Next", you are given only one choice: "Clone"; don't change any option, just click Start. Choose a name and description for your custom roof (don't change the price: leave it to zero); then click "Finish". When the "Scenegraph Rename Wizard" window appears, don't change anything, just click "OK"
Select the Plugin button in the bottom of the screen, then select Texture Images (TXTR) in the Resource Tree. In the right part of the window, you'll see several "Texture Image" entries; select the first one and click the Export button. Do the same with all the other textures: select in turn all of them, except the "...-bump_txtr" one (that doesn't need to be modified), click the "Export" button and save them onto your hard disk. Now you have to edit all the textures that you have exported onto your hard disk; read the hints and tips about editing the roof textures in Post #2. When you have edited and saved the textures, it's time to import them back into SimPE. For each texture (again excluding the "...-bump_txtr" one), right-click on the image and choose Build DXT. The DDS Builder window will open up. Click Open and browse to your edited image (be sure not to confuse the different textures). 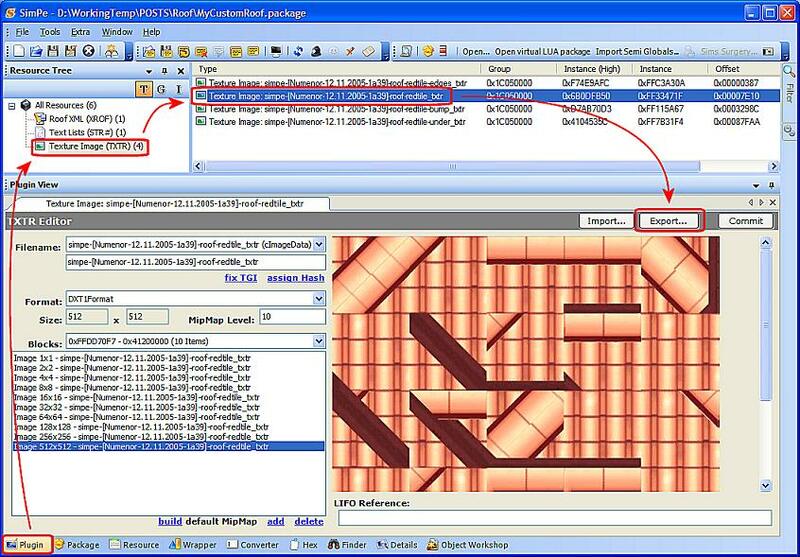 Before building the image, check the Format drop-down list, in the DDS window and choose DXT1 format. Then click Build, and your image will be loaded into SimPE, replacing the original one. COMMIT AND SAVE. 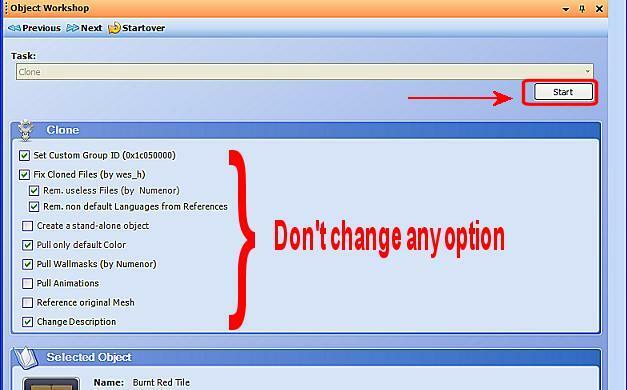 FAQ: Why should you use the DDS utilities, instead of the easier "Import" button? Because the DDS utilities, in most cases, ensure a better looking result (the "Import" button uses a compression routine that tends to lose details, thus creating inaccurate textures); this is mostly true with transparent textures. Moreover, the DDS utilities let you import images with different sizes than the original one, which is impossible with the standard "Import" function. 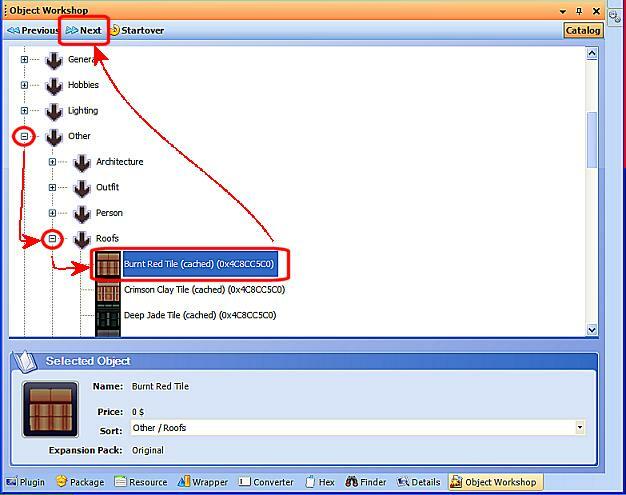 Import using the "Build DXT" function all the textures, then COMMIT AND SAVE. STEP 4 - CHANGING THE GUID (not strictly needed but strongly advised). If you never registered a GUID, just skip this step; but when you upload your new roof for other users to download, you should state that your roof uses a random GUID. If, on the other hand, you are a creator and you have reserved a GUID block from the repository on SimPE site, then read on. 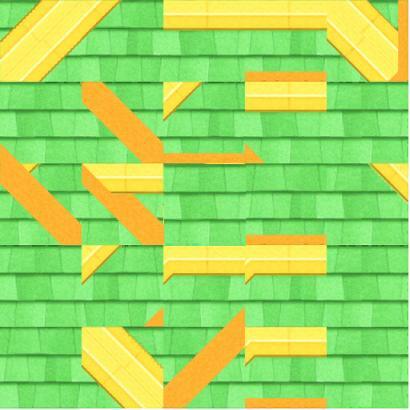 The roofs are identified by a unique GUID, just like the cloned objects; but the roofs can never create GUID conflicts with objects: a roof and an object can have the same GUID and nevertheless the game will run smoothly, without any problem. When cloning a roof, SimPE automatically creates a random GUID for it; obviously, SimPE can't ensure that the GUID is really unique. The risks of conflicts are quite low, because the custom roofs made by users are very few. But we strongly suggest to re-use for the roof one of the GUIDs that you have already registered for an object (you can get a list of all the GUIDs you registred so far from the GUID Web-Frontend on SimPE site). 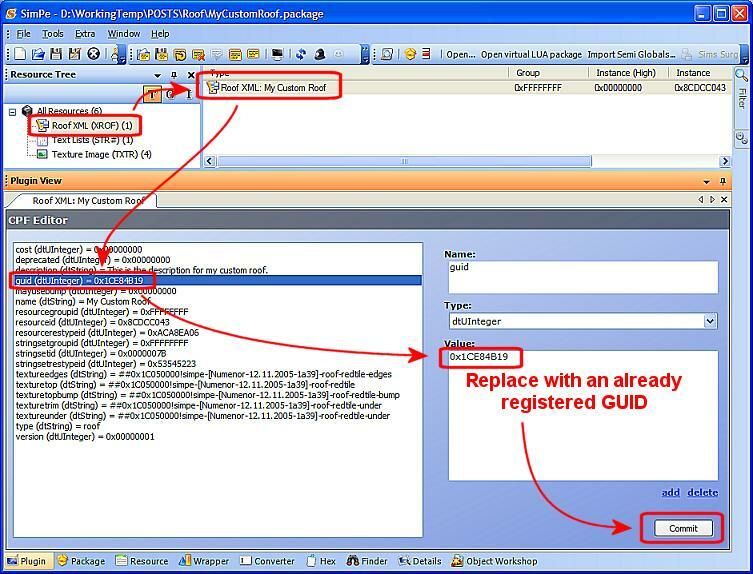 The GUID, in the roof package, is contained in the "Roof XML" file: select it and write your GUID into the "guid" field. The game can manage custom roofs (and custom fences, neighborhood objects, terrains, etc...) only with an EP installed. Without any EP, the custom roofs don't appear in the catalog. There is a workaround, that will make your roof compatible with the base-game (without EPs), but this workaround might create conflicts in other people's games, so please read carefully the following instructions. If you have provided a unique GUID for your roof, as explained in Step 4, then there is basically no risk in using this procedure: you can follow the instruction and make your roof safely compatible with all games. 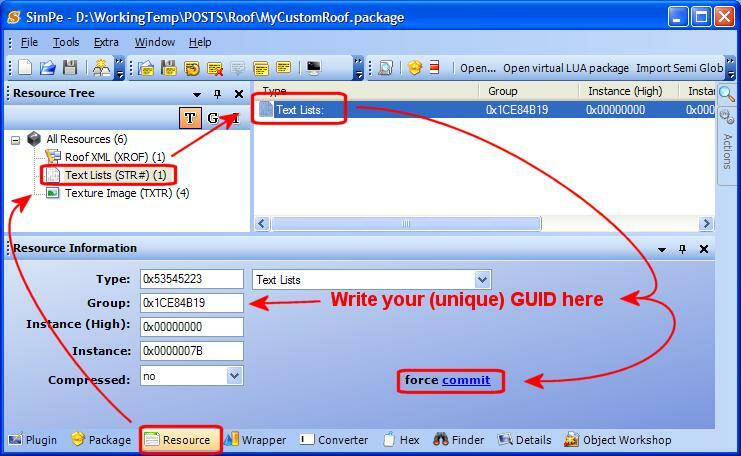 If your roof uses a random GUID, you can make it compatible with the base-game, too; but you should state clearly, when you post your package, that your roof may create conflicts with other custom roofs. 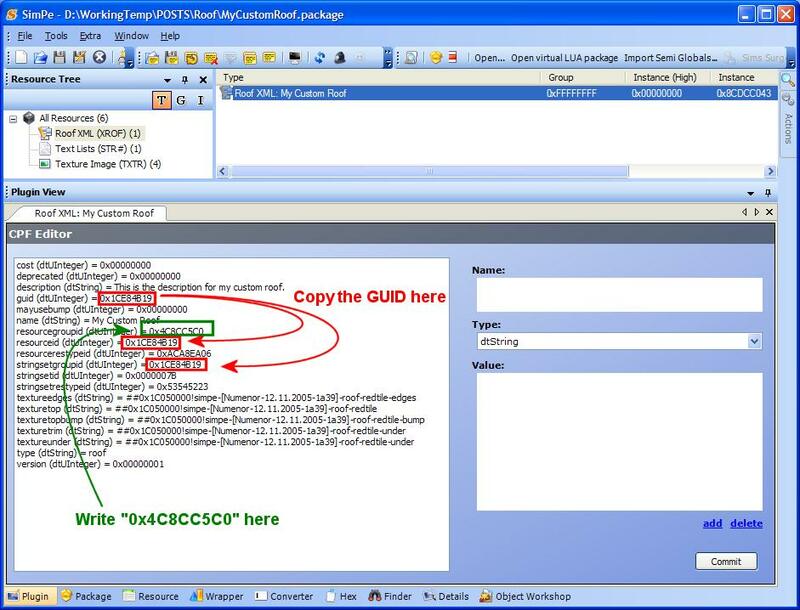 copy the "guid" (which should be a unique value) into the following fields: "stringsetgroupid" and "resourceid"
copy the value 0x4C8CC5C0 (which is the global group for roofs, fences and stuff) into the field "resourcegroupid"
You're done! 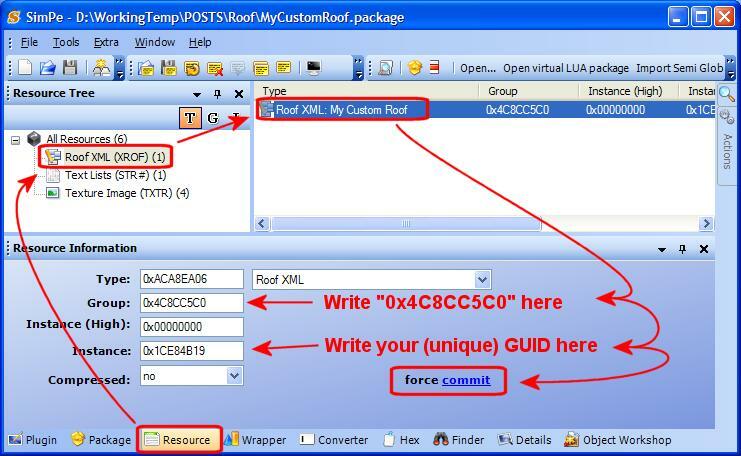 Copy the package into the downloads folder and start the game: your custom roof will be available in the Build Mode catalog, in the Roofs section. In a roof package there are several textures; in particular, we find the textures for edge, trim, under and bump; plus, obviously, the main roof texture. And the "bump"? The Bump Map is a special "overlay" texture that is used to give visual depth to a bidimensional image; it alters the way the light hits the surface, thus creating the illusion of a 3D mesh: look at the following screenshot, keeping in mind that in both halves of the picture is used the very same "plain and uniform grey" texture. The problem is that not all the graphic cards have the ability to use and show the bump maps: we always have to keep in mind, when creating recolours with bump maps, that they may look ugly in someone else's game! For this reason, in all the Maxis roofs, the bump maps are deactivated by default; instead, Maxis preferred to create detailed textures, that have a "3D look" even without the bump maps. The edge, trim and under textures are fairly simple: just use a uniform pattern, or a solid colour, that will match the main roof style; avoid using "orientated" patterns: vertical, horizontal or diagonal lines will look terrible in edge, trim and under! The method consists in recolouring the main texture with plain, solid colours, and rely on the bump map for adding a touch of realism. In order to activate the bump map, you have to open your package, select the Roof XML and change the parameter "mayusebump" from "0" to "1". In this example, I've coloured some parts in red, but the result would be equally nice even with a completely, uniform green texture, because the bump map adds the 3D details where needed. Not so good-looking, uh? That's why I said that this method leads to good results, but not always. We can leave the bump maps deactivated, and fiddle with the texture, in order to create a roof that will look the same in every game. 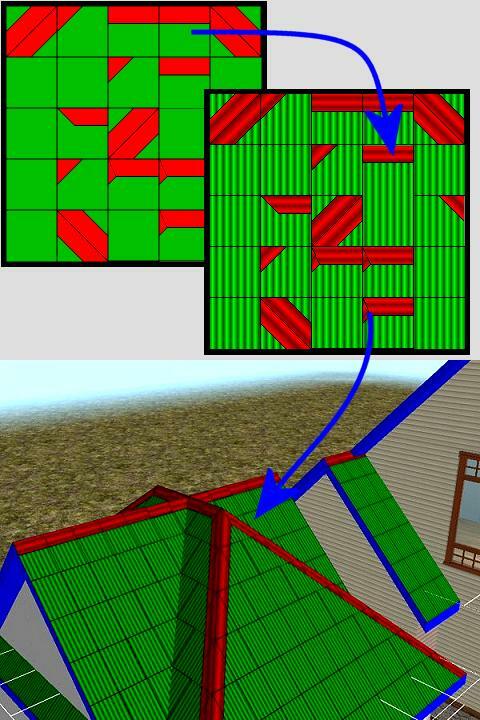 Download the "Roof_Template_Simplified" texture, at the end of this post, and recolour is using an orientated pattern: use a vertical pattern for all the green parts; for the red parts, try recolour it respecting the orientation of each single part. Look at the following example. Another method to create good textures without much efforts, and with good results, is to re-use the "bump" texture contained in the package, and tweaking it in order to give it more contrast and colour. Just load the "bump" texture in you paint program, and fiddle with tint, hue, contrast, brightness and so on, until you get a satisfactory result. 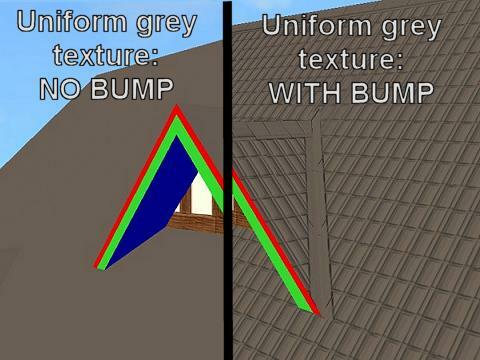 The results, using this method, are basically the same as the Method 1, but in this case we don't activate the bump maps, and therefore there is no risk that our roof will look ugly in other games. This is a preview: download the full image "Maxis_Template_Complete" below. You have "just" to edit each and every section of the template, changing the pattern and the colour, following the alignment references in the template. Remember that the brighter yellow parts are the "top" junctions of the roof, while the darker yellow parts are the "bottom" junctions (where two descending roof sections meet). As you might guess, it's a hard work, but if you have the needed skills, this is the only way to create a really brand new and original roof. Good luck! Wow, I think I'll try one of the easy ways! I'm very bored by the Maxis-Roofs. Yes, I personally like Method 2 (for more original creations) and Method 2 (for easier but "standardized" roofs). I wanted to make kind of a "straw" roof, to make little houses on the beach for example. Here is a picture of what I've done (it's a random house so just look at the roof! ). I'm not happy about it, because texture's repetitions are too visible. I'm not really good at texturing, I'm a beginner but I'd like to learn. The "textures that allow repetitions" are called seamless textures: there are many sites that offer seamless textures for free; and if you use PaintShop Pro or PhotoShop, you can transform any image into a seamless texture using the "Simple QuickTile" plugin offered for free on THIS SITE. I've copied your pattern from the image you've posted, and applied the QuickTile effect, and then I've tiled the new seamless pattern on the image. 1) If the image has too much "sharpness" and contrast, the result will look unnatural: I've applied a very mild blur and reduced the contrast a little. 2) Specifically for the roof textures: the game always darkens the image, when rendering the roof; therefore, the original texture should have a slightly excessive brightness, if you want to find, in the game, the desired tint (I've enhanced the brightness a little). Try and replace your texture with the modified one, that you can find attached to this post: I haven't tested in game, and anyway my modified texture is far from being perfect; but I'm quite sure that it will give a more natural look to your roof (please, post a picture of the result). Thank you so much Numenor !! I tried with your texture and it's really better ! You're right about brightness, I knew this but I didn't enhance it enough obviously. Now I have to work on the edge and trim files to make it look more realistic. Yes, now the junctions between the tiles are not visible any more. I'd increase the brightness some more: the roof still looks too dark, compared to your original texture, in my opinion. First of all, THANK YOU for this wonderful tutorial! It is very well-written, complete, and easy to follow. This is the first time I've ever made anything in SimPE that actually worked in the game. It's a small feat, but it made me excited! The first thing I've tried making is a snow-covered roof. 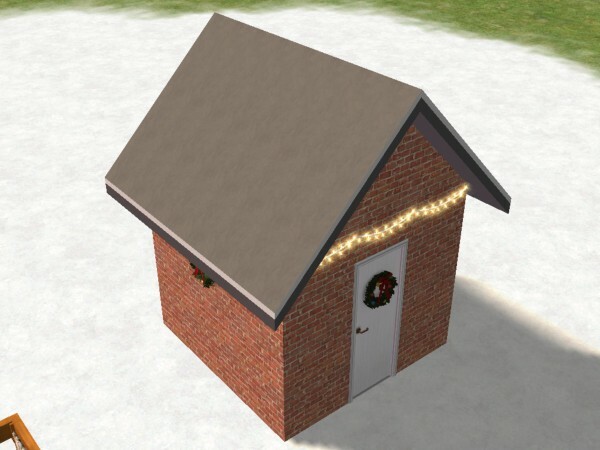 I made a snow ground texture (which turns out nicely in the game), so I tried applying the same texture to the roof. But it didn't turn out very well because the texture is darkened once it is applied. 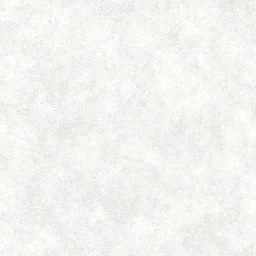 (The actual texture is attached along with a screenshot of the roof). Can anything be done to prevent/lessen the darkening of textures? Is there a way to add reflective or transparent properties to a roof? I'm afraid the answer is "no" for all your questions... I'm not sure 100%, but for what I could see, all the roofs use the same materials definition (called placeholder_roof_material_txmt). Changing its parameters would affect all the roofs at once (including the Maxis ones). The only thing I can suggest is to enhance the brightness and (slightly) the contrast of the original image. I finished my roof. I tried to make a straw texture for the edge and trim files, but it was all messy so I finally let them black. Thanks again for this great tutorial and for your help Numenor ! As for the edge & trim, as suggested in the tutorial, the best choice is to use uniform colours: any pattern will look terrible! Wow - all this work just to get a new roof colour. I am grateful for the tute - it is really well written but I don't think I could ever have the time or patience to do this. 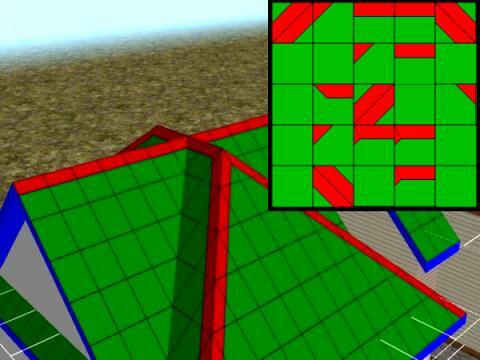 Why didn't Maxis stick with the old Sims 1 way of doing roof textures when we could recolour and retexture them as easily as a floor tile?? Hi, can you help me..I think I am going wrong somewhere! When I get to the part in the tutorial that tells you to right-click on the image and choose Build DXT, my build DXT is not highlighted..any suggestions? you probably don't have the Nividia DDS Utilities installed, or SimPE didn't find them. I had the same problem when I did my first recolor in Object Workshop - if you don't have the DDS Utilities, download them from Nvidia, there's a link from sims.ambertation.de and also directly inside SimPE at Extras/Options, if you don't have it installed. If you have them already, go to Extras/Options in SimPE and browse for the folder where you installed them. Thats great! thank you for your help! They were installed some time ago, so I found the folder again. Can I use this when I recolor objects ? Because when I recolor, I always get a bad texture, and a bad result ingame (like big pixels...) so this might help me to win qualitiy, no ? Using the DDS Utilities should be always the first choice, in my opinion. Only in some rare cases (cartoon-style images of grayscale images) the DDS give a poor relsult. Hey Numenor. Thanks for this great tut and the link to the seamless mesh filter (though I can't seem to figure out how to use that yet LOL)... but, I want to ask you. Since I have the Nvidia plugins for Photoshop, instead of using Build Txt, I just right click on the texture and choose Import DDS...is there any advantage to using Build Txt or is it the same thing? Just wonder if it's good to create a local materials definition yet? If that can be done, one can really play around many other settings. But, will it affect te shadowing effect and other graphical effects? Niol, as I've stated in post #10, all the roofs use the same built-in TXMT; I still don't know if there is a way to make the roof use a custom TXMT, but I think it's not possible. Thanks so much,Numenor,and of course Thanks to all people who helped on this thread. I am just a beginner at recolouring objects and I am very bad with Paint,Corel etc.But since I love this game I practiced and learned a lot...Just today I followed your tutorial and was able to recolor a Roof + a Fence.They work fine in the game!I am lost in Happiness(Yes! ).Don't ask me if they are beautiful and well done..The answer would be "no", they are only poor recolors,but they are done and they work.For me it means a huge step.And its the result of your genial teaching.I am very grateful.Thanks forever! Oh thank you numenor!!!!!!!!! I always wanted to make my own recolors, and now i finally understand how!! !